Composer and sound artist Caroline Devine has been selected to create a large-scale and ambitious new artwork which will celebrate the sounds of the unique city of Milton Keynes in its 50th anniversary year. The project is part of City Club and will be led by Bletchley Park working in partnership with Milton Keynes’ arts and heritage organisations, the Open University and MK Gallery. The artwork will explore the heritage of Milton Keynes and the way in which sound relates to people, memory, time and place. Describing her plans to develop the work, Devine states: ‘I am starting a sonic investigation of Milton Keynes that will include sounds, signals and voices from the city. I’ll be listening, researching archives, making field recordings and interviews and presenting this work both in the form of a multi-channel sound installation and online’. The resulting piece is set to be installed in centre:mk in October 2017. Iain Standen, Chief Executive Officer of the Bletchley Park Trust said “Bletchley Park is an important element of the heritage of Milton Keynes and we are proud to be playing a part in the 50th birthday celebrations. As Bletchley Park is a birthplace of the digital age, it is very fitting for us to lead the digital strand of the City Club project, and we look forward to Caroline Devine’s innovative work delivering a bridge between the past and the future, and an exciting experience for everyone to enjoy”. Kevin Duffy, Centre Director at centre:mk says: “centre:mk has a long, proud history of supporting the arts in Milton Keynes and we are delighted to host this exciting soundscape by Caroline Devine. Our iconic building is the perfect venue for interesting and unusual art installations, and they never fail to surprise and delight our guests”. Devine’s site-specific sound installations provide playful and unexpected encounters with sound outside of a conventional gallery setting. She has twice been nominated for a BASCA British Composer Award for work based in Milton Keynes: in 2014 for On Air, a large scale outdoor sound installation for The Open University campus in Walton Hall; and in 2013 for 5 Minute Oscillations of the Sun, outdoor multi-channel sound installation in the Dome, Theatre District. The commission forms an integral part of City Club, a city wide programme of new art, performances, family activities, commissions, happenings, events and talks inspired by the original cultural plans for Milton Keynes which will enable thousands of people throughout Milton Keynes to explore, enjoy and be inspired by their surroundings. Led by MK Gallery and delivered in partnership with the city’s arts and heritage organisations, the project takes its name from the unrealised national leisure complex proposed for the city by Milton Keynes Development Corporation in the 1970s. An interview between Caroline Devine and Iain Standen of Bletchley Park can be found in issue one of the City Club newspaper which is available for download HERE. It’s the final weekend to see a new installation by Bedford based artist Andy Holden, commissioned by MK Gallery, within the MK50 anniversary exhibition, A New City Comes to Life. The artwork, which is currently on display in Middleton Hall, the centre:mk, is based on a series of staged photographs of young couples kissing against iconic public sculptures in Milton Keynes. These photographs are hung on large-scale cut-outs of the sculptures, creating a mini sculpture park, which the artist imagines as a stage set for more activities and interaction. Some of the most well-loved public artworks in Milton Keynes are featured in the installation. Elisabeth Frink’s Horse, Essence by Wendy Taylor and The Space Between by Eilis O’Connell sit alongside replicas of three classic works by Bernard Schottlander. Andy Holden’s interpretation of these MK landmarks is part of the body of work, MI!MS (Maximum Irony! Maximum Sincerity), a manifesto for art practice that Andy and a group of four friends developed when they were in their teens. A film and paintings from MI!MS, can be seen in MK Gallery’s Project Space until 28 January. The installation also marks the beginning of City Club. During 2017, MK Gallery will bring together artists and arts organisations from across Milton Keynes to celebrate our unique city’s 50th anniversary through a programme of new art, performances, family activities, commissions, happenings, events and talks inspired by the original cultural plans for Milton Keynes. The project will enable thousands of people throughout Milton Keynes to explore, enjoy and be inspired by their surroundings. Visitors to the Middleton Hall exhibition can find out more about the programme and Andy Holden’s artwork by picking up issue one of the City Club newspaper, alternatively download a copy HERE. A New City Comes to Life runs until 23 January 2017. Entry is free. Following the recent exciting news of Arts Council England’s Ambition for Excellence (AfE) Award, we were delighted host a first meeting of our City Club programme partners last night, attracting good numbers despite the wet and windy weather! The meeting gave partners the chance to hear about their respective organisations and activities via short informal presentations. In welcoming partners, Director Anthony Spira described the broad scope and ambition of the City Club project which already includes some 56 partners. Whilst the £750,000 enabling grant from the AfE is fantastic, Anthony noted that there is still a further £300,000 to raise in order to deliver the full project vision. Everyone was thanked for participating, especially programme strand lead partners Bletchley Park, The Stables, On the Verge and Milton Keynes Arts Centre. The proposal to meet again in three months’ time to hear how early ideas for the various project strands are progressing was agreed by partners. Those who contributed short presentations last night were: Anthony Spira, Director, MK Gallery; Cllr Liz Gifford, (who will Chair the City Club Steering Group); Lucy Bedford, Arts Development Officer, MK Council; Monica Ferguson, CEO, The Stables; Iain Standen, CEO, Bletchley Park; Claire Sapsford and Thomas Eke, Milton Keynes Arts Centre; Dr Andy Hewitt, Freee (artist collective); Simon Wright, Curator of Public Programmes, MK Gallery; Myriam Metcalfe, On the Verge; Yaw Asiyama (Milton Keynes artist); Victoria Mayes, Head of Learning, MK Gallery and Claire Louise Staunton, Inheritance Projects & Research Curator, MK Gallery. There was also a short video contribution from Project Art Works, Hastings. There will be opportunities for other partners to present their projects and ideas at future meetings. A City Club Creative Producer post is currently being advertised. The deadline for applications is 21 March 2016. For full details visit our website HERE. Arts Council England has announced that MK Gallery is one of three successful applicants to the latest round of its Ambition for Excellence programme, and is to receive £750,000 for the ambitious ‘City Club’ project. City Club is the exciting new programme of arts and culture led by MK Gallery and devised with artists Gareth Jones and Nils Norman. The programme will bring arts organisations, artists and communities from across Milton Keynes together, to help celebrate Milton Keynes’ 50th anniversary and the launch of the expanded MK Gallery in 2017. City Club aims to refresh the area around MK Gallery, MK Theatre and the approach to Campbell Park in the city centre, creating welcoming spaces that everyone can enjoy. 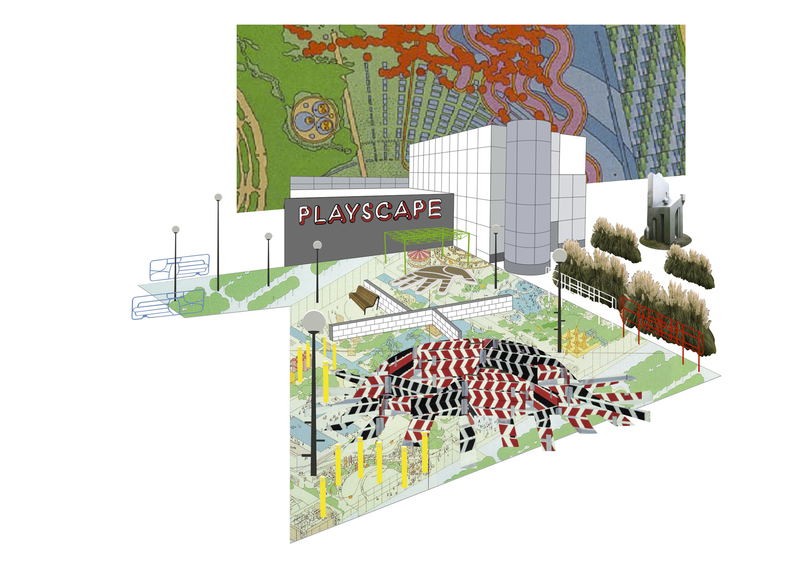 Inspiration will be taken from the iconic original designs for Milton Keynes and focus on three types of public space: the piazza, playground and garden. City Club will include new public art commissions, a programme of live events led by The Stables, digital projects led by Bletchley Park and partners, and numerous talks, workshops and engagement programmes. These city-wide activities will provide important talent development opportunities for local artists, unite many of the city’s arts organisations in their delivery, and involve extensive and diverse communities. City Club is designed to strengthen the network of arts organisations across Milton Keynes in order to increase the profile and impact of cultural activities in the city and to prepare a Milton Keynes bid for European Capital of Culture 2023. Ambition for Excellence funds the first phase of City Club. Audiences and partners engaged through this phase will enjoy future use of world class art facilities via MK Gallery’s £11 million renovation and expansion. A ‘Citylab’ will be formed – a mini-faculty of local artists, architects, musicians and writers – to brainstorm and animate the project as it develops. Freee Artist Collective and renowned American artist Vito Acconci will work with the Milton Keynes Arts Centre to create a large-scale mobile sculpture called ‘Citizen Ship’, which will travel throughout the city visiting residential estates, schools and playgrounds. Project Art Works will continue working with MK Gallery on programmes involving people with severe and complex needs. Artist Stuart Whipps will produce a film and book documenting the project, while curator Claire Louise Staunton, in association with the Open University, will organise a seminar and conference around art’s role in building communities in New Towns across the world. Playing Out delivered by artists Townley & Bradby, and Meet Back Here will help forge strong relationships with the Gallery’s neighbouring estates of Fishermead, Springfield, Downs Barn and Conniburrow. These activities will form part of a larger engagement programme connecting MK’s diverse communities through consultation, exploration and participation. City Club is funded by Arts Council England and MK Gallery, with support from Milton Keynes Council. For Arts Council England’s national news announcement today on the Ambition for Excellence recipients see HERE. A packed audience of almost a hundred people enjoyed Gareth Jones and Nils Norman’s City Club presentation here on 10 December, and now we’re pleased to be able to share it with you via this LINK. Gareth and Nils have spent recent months brainstorming options for developing a sequence of public spaces between Milton Keynes Theatre, MK Gallery, Campbell Park and Midsummer Boulevard – including ideas for landscaping, enhanced signage and a new ‘playscape’ – that would create a dynamic, welcoming environment to be enjoyed, used and animated by visitors and residents alike. In their presentation, Gareth and Nils referenced the Milton Keynes Development Corporation’s unrealised plans for a national leisure complex in the 1970s and how it had inspired their thinking, research and ideas. Imagery alternated between a mix of Milton Keynes Development Corporation archival materials, cultural images typifying decades from the 1960s to the present, and Gareth and Nils’ sketches and models. The audience enjoyed slides ranging from a photo of an MK playground designed by Archigram (sadly demolished), to the cover of a David Bowie album, a Biba design for a baked bean can, and the extraordinary exterior of the Guggenheim museum in Bilbao. Gareth and Nils shared different ways that MK has responded to the last six decades, touched on the influence of modernism and post-modernism on the public realm, and how they’ve developed their own “what if…” series of sketches, models and drawings for a series of spaces that everyone can enjoy. The artists referred to their respect for the Central Milton Keynes grid plan, and the original city infrastructure, including key elements of paving, porte cocheres, distinctive benches, and globed street lamps. They flagged that many of these features are missing in the Theatre District and said they’d love to reintroduce some of them, suitably developed for the 21st century. Through their City Club proposal they wish to offer people an exciting “index of possibilities” or conceptual framework to reanimate and bring back to life the original utopian vision for Milton Keynes. The evening finished with an enthusiastic Q&A session, including participation from some of our arts and heritage community and local councillors. Gareth and Nils confirmed that, should funding become available, the City Club would enter an extensive period of consultation with groups and individuals, and start to address some of the scheme’s specifics and practicalities. For a flavour of the presentation, we share this short slide show, which includes views of the talk and of the research sketches and models that the artists displayed for the audience in the next room. And finally, there is a happy picture of the Deputy Mayor of Milton Keynes, Cllr Stephen Coventry and the Deputy Mayoress Leanne Lacy, who’d just been saying how much that they’d enjoyed the talk and how they looked forward to keeping up with the City Club’s progress. Gareth Jones and Nils Norman have received support from the National Lottery through Arts Council England.